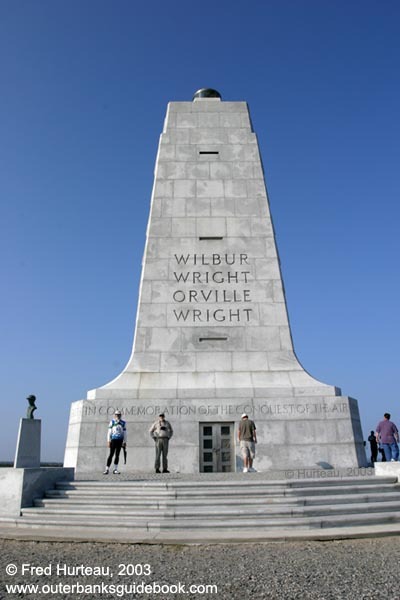 Wright Brothers National Memorial is easy to find on US 158 at Kill Devil Hills. 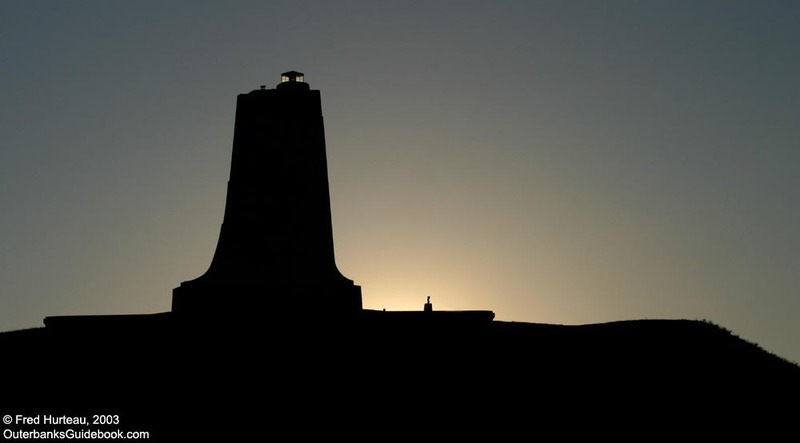 The monument itself is an imposing 60-foot tall granite monolith atop a great 90-foot high dune that has been stabilized with grasses. 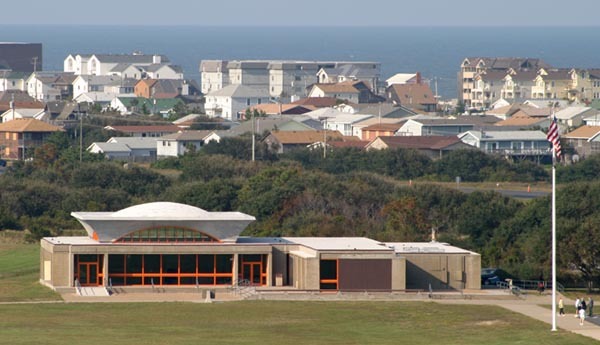 The Visitor Center (left) offers displays about the Wright Brothers. Even the sewing machine they used to sew the wing material is on display. 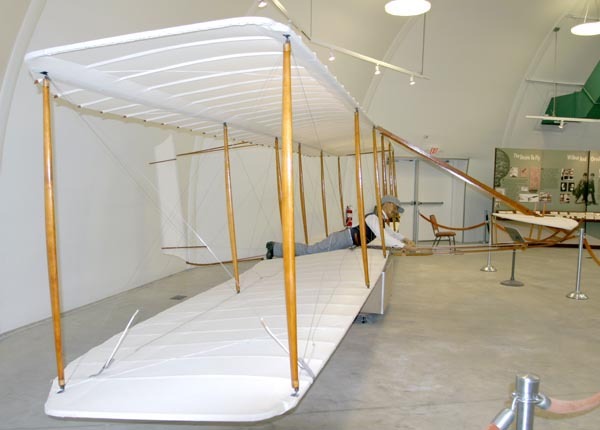 But the centerpiece and biggest attraction is the replica of the 1903 Wright Flyer (below). 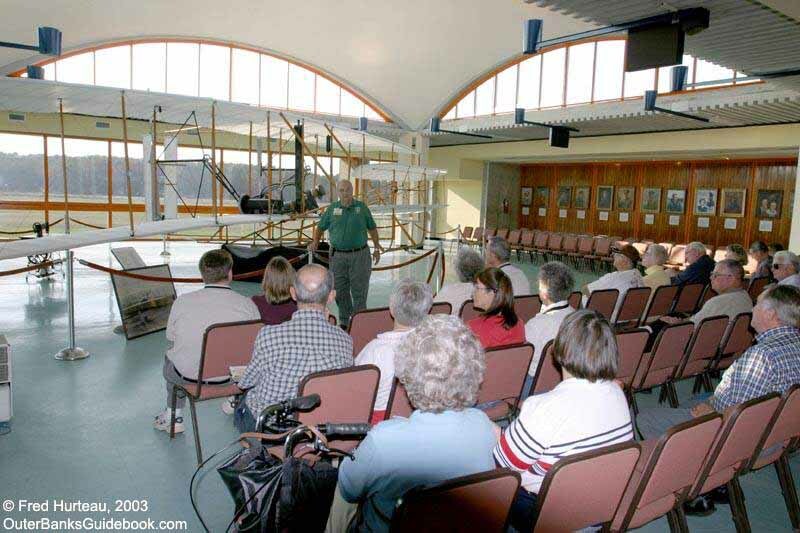 Leading up to the centennial celebration, visitors were treated to detailed talks on the Wright Brothers exploits, conducted by knowledgeable park service volunteers (below). 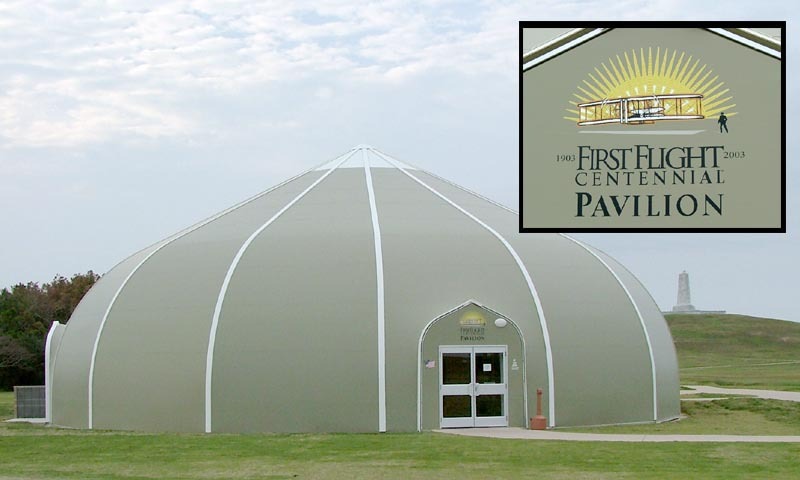 The "First Flight Centennial Pavilion" building set up at the memorial site especially for the celebrations (see additional Pavilion photo) held various displays, including one that described what life on the Outer Banks was like for the Wright Brothers. 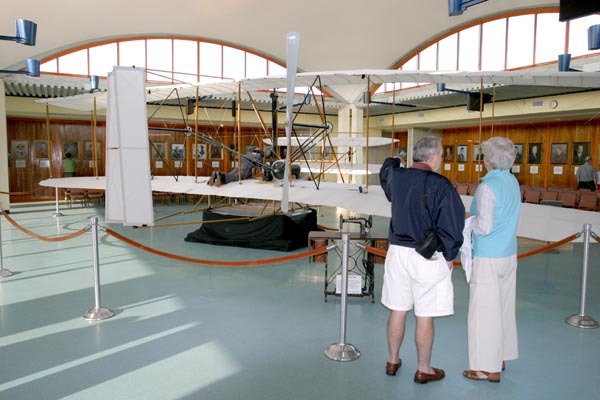 A reproduction of the glider they used for testing before making their later powered flights was a major part of the pavilion displays (see additional glider photo). 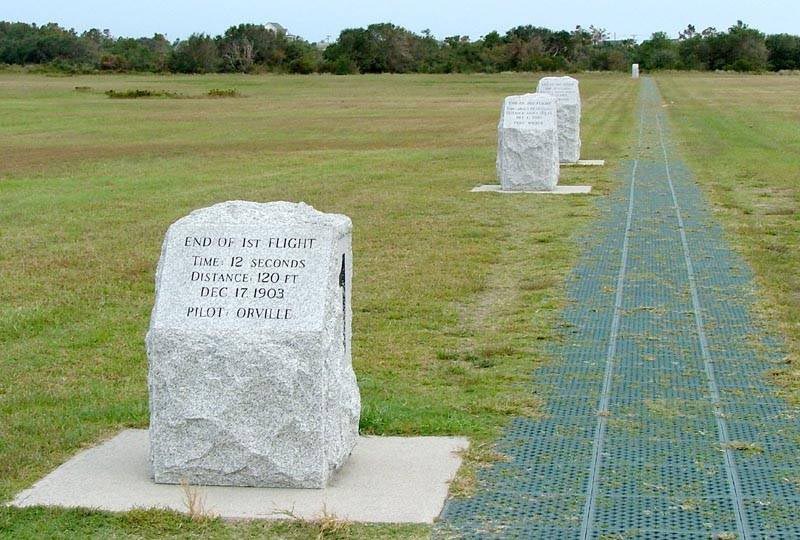 The memorial grounds have granite markers (right) showing the distances of each of the Wright's first four flights (left). 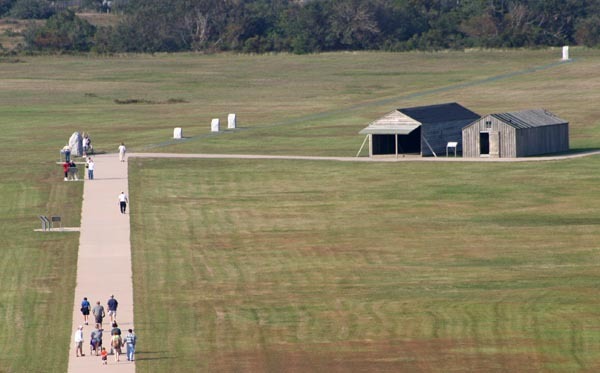 Replicas of the hanger and living quarters used by them give some feel for the primitive conditions under which the Wright Brothers had to persevere to achieve their historic accomplishments. Above: Replicas of the hanger (left bldg. ), and living quarters (right bldg.). 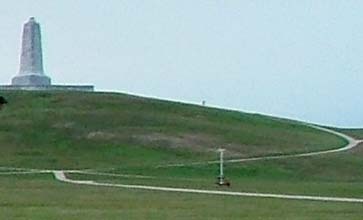 Below: Facing the memorial pylon from behind the hanger. 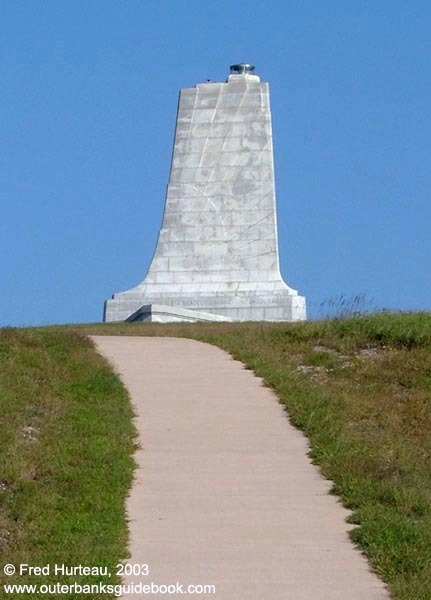 The memorial pylon's appearance changes with angle and lighting. 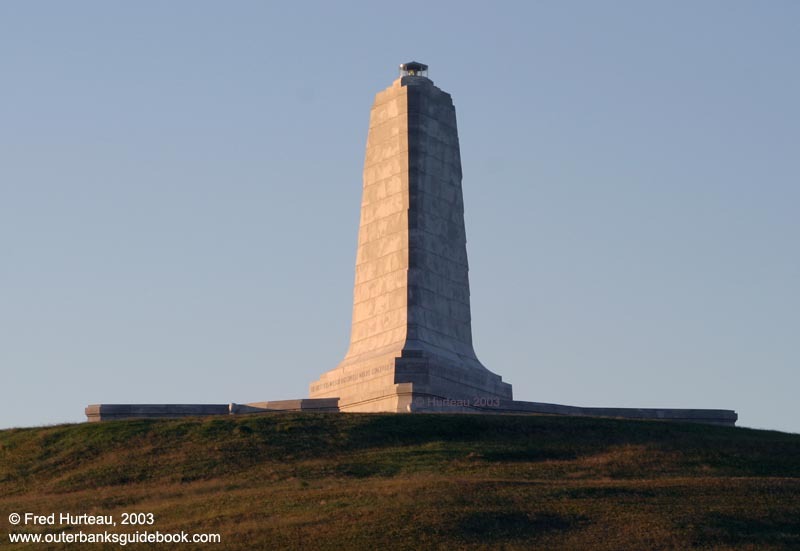 A bright clear day shows the true gray/white granite color ( 3 upper photos). The golden light of a sunrise (below) changes the appearance drastically. Flash Back 30 Years: In 1973 (left), there were a few trees and bushes on the west and south face of the hill. In 2003 (right) there was not so much as a single small bush. 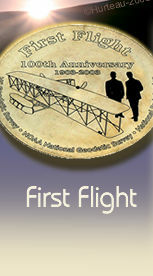 For the First Flight Centennial celebration there was a new "sculpture" installed just south of the memorial pylon. 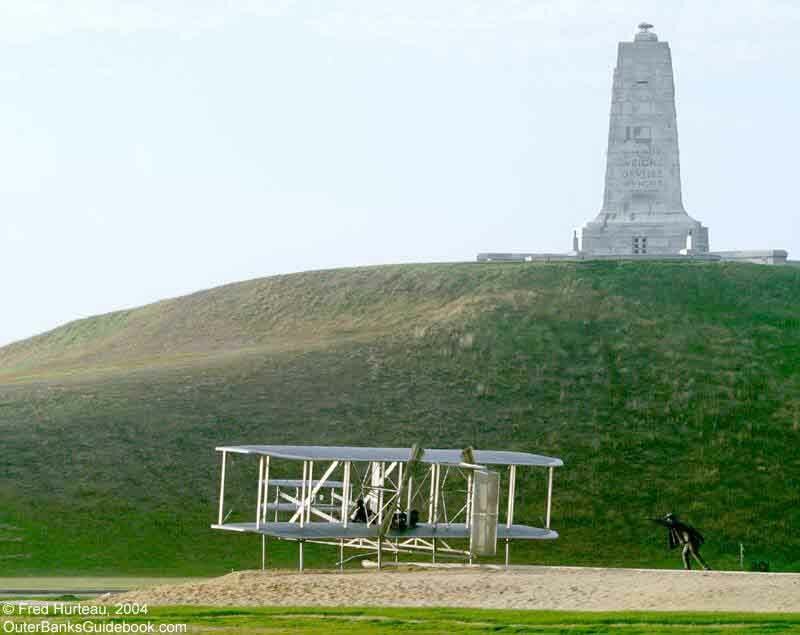 The Wright's historic take-off is recreated with three figures (the Wright brothers and the photographer) sculpted in bronze, and the Wright plane in bright stainless steel. The detail and figure action is amazing lifelike. Though it is frozen in time, it looks as though it is moving. 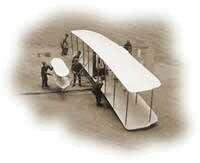 You can feel the excitement, as Orville takes off, and Wilbur runs along behind, arm outstretched as if yelling "Go, go!" to Orville and the plane. The figures and the plane are life-size, and the plane is supposed to be sturdy enough for children to play on. Yet, it still looks as if it could actually fly. 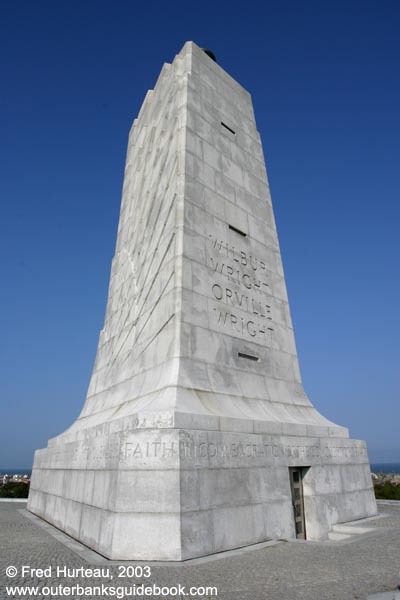 Be sure to see this sculpture when visiting the Wright Memorial. 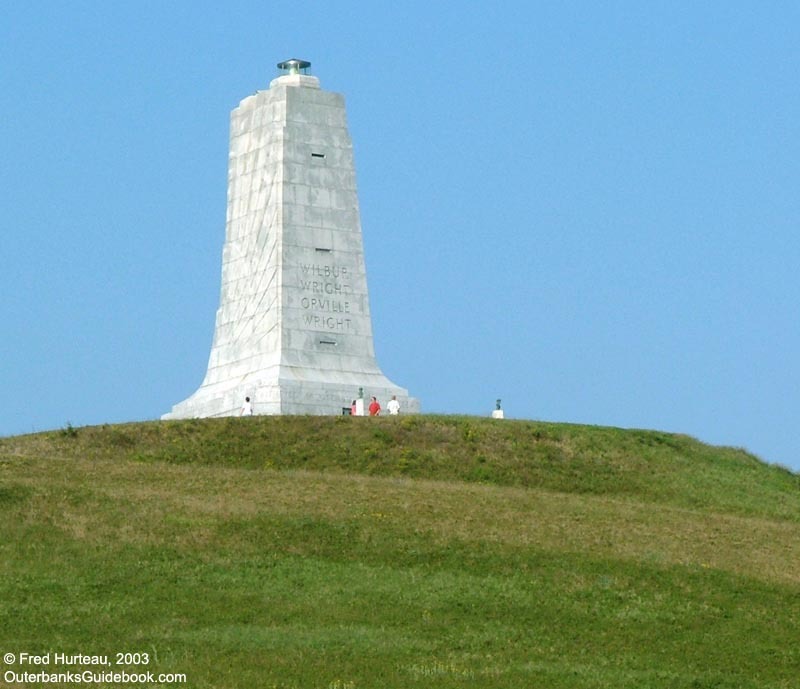 It is visible from the road along the south end of the memorial property, but to access it, you must be inside the park, and drive or walk around to the south side of the dune. Four more figures will be added to this action sculpture scene in the future. They are the only other witnesses to the flight. 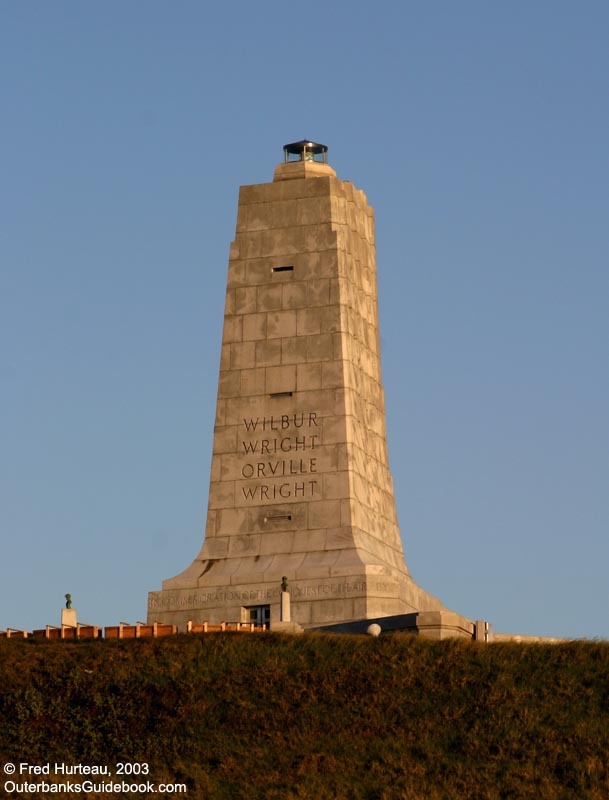 The first to be added will be Adam Etheridge, who was a member of the Kitty Hawk Life-Saving Station, and who helped the Wrights at every opportunity.